We all know that when it comes to cold weather workwear, there’s nothing better than an insulated bib. Not only do they provide protection and warmth, but they also help you stay focused by keeping you comfortable, clean and safe in cold weather conditions. With so much riding on the performance of your workwear, it’s important that you find the best insulated bib for the job. There are several things to consider when finding a pair of high-quality insulated bibs that works as tough as you do. Since there’s so many kinds of bibs, it’s really important that you think about what you’ll be using your workwear for. This will help you decide which features are most important in a bib. For example, farmers and ranch hands working in cold conditions need insulated bibs that allow for lots of movement while they scrape pens and check cows in the winter. So they might choose a softshell insulated bib because the material is flexible, water-resistant and breathable. For construction applications, workers want an insulated bib with high visibility to keep them safe while working in low-light conditions. Finding a reflective insulated bib that meets specific ANSI standards should also be a priority for these workers. You’ll also want to consider the weather conditions and how long you’ll be on your feet for. A construction worker holding a sign all day in -50°F with strong winds will need a different insulated bib than someone doing manual labor in temps hovering just below freezing. If you’re going to be active for most of the day, you’ll need less insulation than someone who is less active. Also, keep in mind that sweat can cool the body if it’s trapped inside your insulation. In this case, look for bib features such as front and side zippers which provide extra ventilation. Finally, pay attention to the insulating power of your bib. Insulating power can range from 200g to over 1000g (measured in gram weights). The higher the number, the more insulation your clothing will provide. What can be annoying about purchasing an insulated bib is figuring out the sizing. Sizing can be different by brand, which makes it hard to find the right size of bib for you. If you’re purchasing an insulated bib from RefrigiWear, be sure to check out our size chart to get the perfect fit. Remember, bibs should fit comfortably without being too tight. A general rule of thumb is to purchase a bib one size larger than your regular waist measurement if your sizing is borderline. Can’t seem to find the right size or have additional questions? Talk with our Customer Service for custom sizing and alterations. Flexibility—Performance stretch fabrics located at key flex points (knees, back, waist, etc.) can add mobility to your insulated bib without sacrificing warmth. Another consideration is adjustable straps, which allow you to customize the fit. Pockets—Few things are more frustrating than being in the middle of a job without having anyplace to quickly store a tool. Pockets can provide breathability as well as convenience for storing tools and valuables. Knee Pads—If you regularly work on your knees, an insulated bib with knee pads is a must. Check out our ErgoForce bib, which has reinforced knee patches and 240g insulation. Quality and Price—Insulated bibs are something you don’t want to be cheap with. 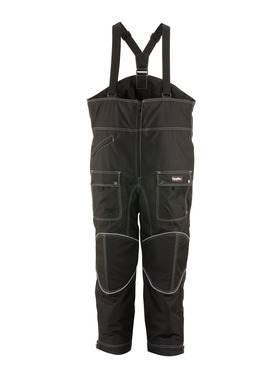 However, you also don’t need to spend upward of $350 to find a high-quality insulated bib. RefrigiWear has been making insulated bibs for over 60 years and can help you find workwear that delivers performance at an unbeatable price. When working in freezing temperatures, you need good insulation to keep you warm and protected as you get the job done. 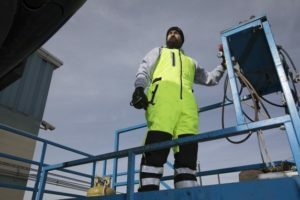 Whether you’re searching for an insulated softshell bib or heavy-duty, industrial strength bibs with unbeatable insulation, RefrigiWear has the workwear you need to stay warm and dry—day in and day out.